Providing the most comprehensive approach to real estate marketing in Toronto and the GTA. There are thousands of searches made in every community across Ontario for business. Toronto, Oakville, Mississauga and Brampton all receive a huge search volume of people searching for business every month and significantly more entering the buying cycle searching for information on those services. Every year more consumers look for services online with searches for business increasing over 125% annually. The thing is, 93% of those consumers searching won’t go past the first page of Google to find the services they’re looking for. VERY FEW businesses have more than a website, even less have an SEO optimized site using lead capturing techniques and again less are in the know about where a large portion of ‘business leads’ are going and to a large degree, have already gone.It’s a very broad subject and you’ll need a professional SEO services agency. The BAD news is that there are only ten spots on page one and there are businesses putting serious digital marketing plans in place. These businesses have a website and web presence that are continually being built weekly, eventually, these website’s will be impossible to catch in the rankings. GETTING TO PAGE ONE WILL SOON BE INCREDIBLY HARD. THE WINDOW IS CLOSING. 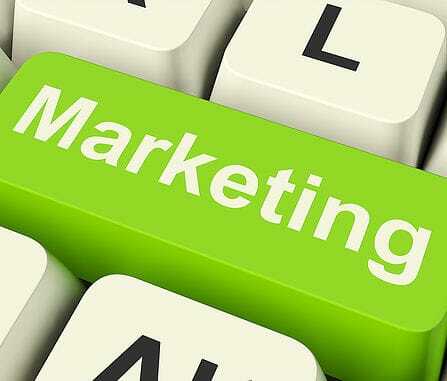 The GOOD news is that it is only a few businesses that have marketing plans in place digitally and those who begin the process of fortifying their web presence now will be the ones to dominate page one of Google in the future with everyone else will be trying to play catch up. 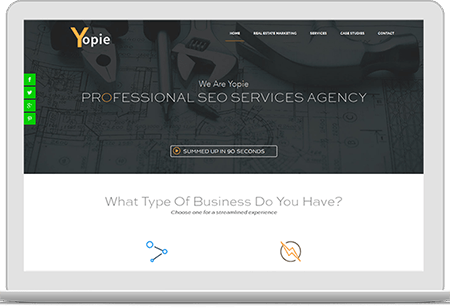 At Yopie.ca we identify what searches are being made in your area by people looking for your services, then target them specifically and when the searchers arrive on page one you’ll be there waiting for them. With 90% of consumers beginning their search online, the question is: Is your website ready to convert them? All sites are pre-designed with scalability in mind, we set your site up with the plan of it growing stronger with every passing month and therefore increasing your rankings leading to more leads. The constant addition of new targeted EVERGREEN content published to the site and promoted via Social Media aimed to meet those targets. In front of your ideal client and only pay if they click. Be an authority in your field, that’s how you rank! Keep yourself in front of and engaged with your clients. Don’t have all your eggs in the search engine basket. Local searches have the largest rate of conversion. Companies that blog receive 65% more leads and rank twice as well as those that don’t, that’s why we have dedicated content, article and blog writers with experience in every field. for Digital Word of Mouth. How Fast Can A Professional Services Agency Rank My Site? The nature of search engine optimization is that it is never possible to tell exactly how long it will take a professional SEO service to rank your website. The process of SEO involves a myriad of parameters and since the ranking is determined by a party which you have no control over as the website owner. Add to these intangibles that some keywords are incredibly competitive, consider that some sites have put years into ranking for them with considerable digital marketing plans. There are some that believe that in the not too distant future page one of Google will be entirely made up of sites that are professionally managed and have digital marketing plans in place constantly building the sites into powerhouse authorities. Unlike other traffic sources which can be used for more immediate results, search engine optimization is a process done following certain guidelines and requires constant effort and time before you can start seeing the results. Many people have tried to manipulate the ranking process by engaging in black hat SEO practices. When such websites are caught by search engines they are automatically de-indexed and then have trouble ranking afterwards. The competition in your niche – ranking in very competitive niches is much more difficult than ranking in less competitive niches. This means that even with professional SEO services it might take some time to rank your website, BUT, a good SEO company can find soft long tail keywords that may not have the search volume of the bigger keywords but are much easier rank for and provide very qualified leads. The link profile of your website – Link building is one of the most important aspects of search engine optimization. With quality links it’s possible to gain good rankings, however, the links should be natural and not look spammy in any way. To achieve this, SEO experts might need time to build the right relevant link profile and even more time for Google to find and index. Quality content – in the past, large volumes of content could see your website ranked on the first page in a matter of days. But this has since changed and the search engines have become incredibly intelligent and now give more precedence to quality over quantity. Again, just like with the links the content should be posted on a regular basis. Even with SEO experts, it will take a time to create and post quality content for the purpose of natural back linking and search engine optimization. Technical SEO Factors – the speed at which a professional SEO service will rank your website also depends on the technical aspects of SEO. These include factors like user experience, the site’s loading speeds, mobile responsiveness, and cross-browser compatibility, all ranking factors. It is possible to have other factors in order but if there are issues with the technical aspects then it might take a little longer before you see the results you desire. Search engine optimization is a quite a dynamic field and it changes constantly. The best approach is to view it as a process and have a professional SEO services agency layout a digital plan that adheres to best practices protecting you from constant algorithm changes.